One of the driving forces of student and staff participation Campus Conservation Nationals is the entertaining, inspiring and clever posters that participating schools create to promote conservation behavior. Popular Vote for posters that received the most votes during the public voting period in April. Learn more about the prize categories and judging criteria here. "This is Glendale Community College’s first year participating in Campus Conservation Nationals. We have 11 buildings with individual meters competing to reduce energy consumption. The planning committee discussed the behavior changes that would be the most impactful during the competition. A hexagon design was used to represent the top six energy-saving behaviors that will be promoted during the competition: 1) unplug all electronics, 2) turn off the lights, 3) bulb exchange, 4) take the stairs, 5) power down computers, and 6) adjust to the temperature set points. The poster is a visual reminder for occupants of the participating buildings to implement these six behavior changes during the competition. The hexagon design on the poster will be used on various promotional materials (e-mail, social media, posters, bookmarks, etc.) in effort to increase energy literacy. By associating each of the behavior changes with a colorful visual representation, our goal is to educate and empower staff and students to conserve energy resulting in long-term behavioral change." "When coming up with this poster design, I wanted something trendy that would be eye catching and get students interested in the competition. I also wanted to give off the idea of energy and conservation. To give the idea of energy I used a light bulb, which is pretty self-explanatory to whoever sees it. I abstracted the light bulb to catch the viewer's attention and draw them in to the text on the poster. To give off the idea of conservation, I used natural colors with a focus on green. These colors are bright though to, again, catch the viewer's attention. This poster was hung around popular areas of the campus and used as the banner of the Facebook page for the campus wide competition." "Our Sustainability Coordinator created these clever posters. We used them to promote our Take the Stairs Challenge, which motivates students, faculty and staff to take the stairs instead of the elevator to reduce energy usage and increase physical activity. When creating this poster, we aimed to make something short, sweet, to-the-point, and highly memorable. Behavior Change Tool #2: Competition. Participants are motivated to take as many flights of stairs as possible to win! Behavior Change Tool #6: Education. Although this isn't explicit, we educate people, or at least remind them, that elevators use energy. We strategically placed these posters next to elevators so people think twice before using them. Behavior Change Tool #10: Incentives. Participants are entered to win prizes no matter how many flights of stairs they record, and the person who enters the most stairs also wins a prize. Behavior Change Tool #11: Prompts. These posters are aids to remind people that taking the stairs is better for you and better for the environment." Since 97% of our students live on campus all four years we knew that posters in the dorms would be an effective way to reach them. In order to catch their eye we went with bright, bold colors, simple visuals and a unified theme. We wanted to give them a new tip each week of the three week contest to focus on so that 1. they didn't get bored or lose interest and 2. they were learning new simple things each week. We also tried to make the tips as student friendly as possible. We got a very positive response from the students. They said that they caught their eye and therefore they actually stopped to read them. We will likely do a similar campaign next year. 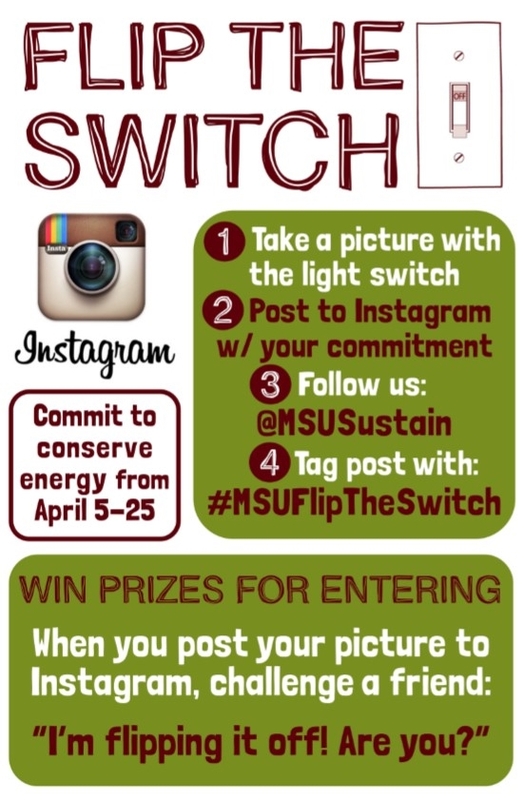 "Our Sustainability Coordinator created this series of posters to promote our Instagram Challenge for CCN. 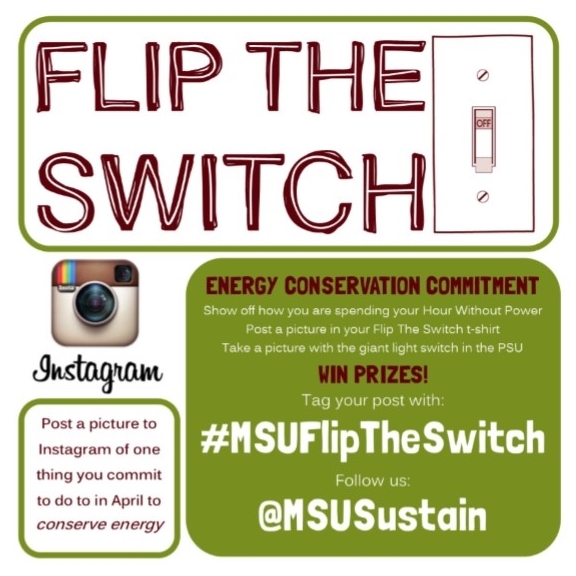 For our Instagram Challenge, we encouraged students to make energy commitments (like using natural light during the daytime), take a picture of themselves displaying their commitment, and then post that photo to Instagram. Our first poster is optimized for Instagram so that it can be posted and shared via social media. 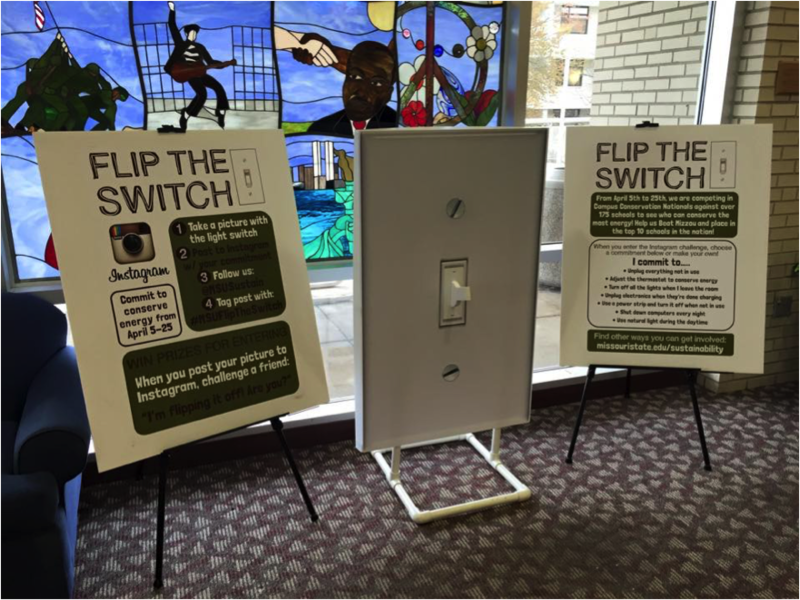 The second and third posters are for displaying next to the giant life-sized replica of a light switch we displayed for the entire month in the student union. We are using these two posters together to make sure students understand what the competition is all about. We used the Marketing and Behavior Change Guide when developing all of our marketing materials and events for our Flip the Switch Campaign. Our Instagram competition posters specifically make use of a lot of different behavior change tools (BCTs). #1: Commitment. Our Instagram challenge asks students to make concrete commitments they are taking and publicly displaying to friends and family via their social media pages, making them more likely to keep them. #2: Competition. Although this is technically a challenge where every participant has an equal change of winning a prize through a drawing, we are motivating students to make big commitments by featuring students who make big commitments on our Facebook page. #6: Education. We are educating students about ways to conserve energy through the poster that has a list of energy reduction tips. #8: Goal setting. By having students make commitments and goals (like committing to never take an elevator during the competition), we recognize that they are much more likely to stick to their commitments. #9: Implementation Intentions. We are motivating students using tabling outreach activities to encourage implementation intentions with the Instagram challenge. For example "I will turn out the lights if I leave the room". #10: Incentives. We are using incentives for students who enter the competition. #12: Social Norms. We are hoping that, since students will be publicly posting their commitments on social media, their friends will also feel more motivated to participate in the competition because they will feel that their peers care, so they should, too." 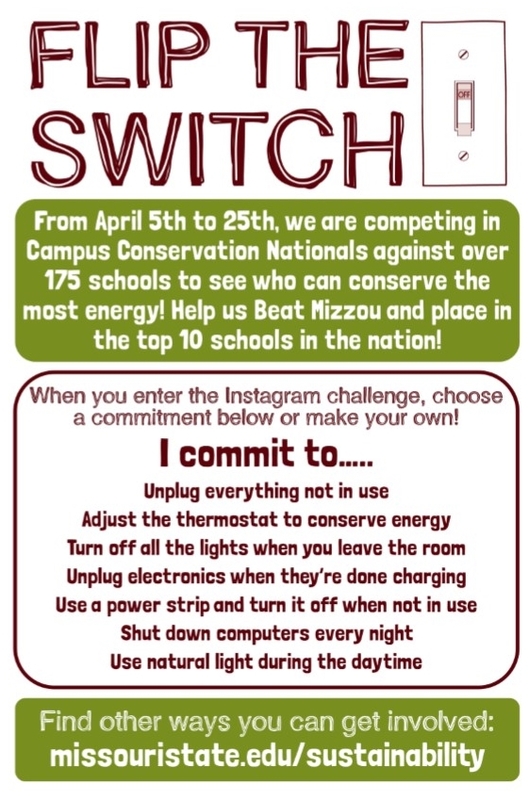 "This poster was put up in the residence halls and sent out throughout various emails to help promote behavior change by encouraging residents to think of ways they can conserve energy. It served as a behavior change tool because the information presented encouraged students to change their behavior. In general, the poster may not have encouraged behavior change other than using education by giving knowledge to residents on how to reduce their energy, but used in a multi-tiered approach through emails, promotions, and activities, the message was made to students to shut off their lights, use cold water for laundry, etc." The poster was used as a way to encourage residents to switch out old incandescent light bulbs for CFLs. "This poster promoted one of the events sponsored by the Resident Assistants to help promote the challenge. We had computers set up and encouraged students to take commitments on the dashboard as well. Students could also exchange light bulbs from incandescent to CFLs."